This week, we attended KAURI’s event celebrating its fifteenth anniversary. KAURI is a Belgian CSR organisation. All the presentations were brilliant but I was really inspired by one of the speakers, the Belgian Professor Philippe Van Parijs. As he was fed up with cars taking over public spaces, he wrote an article asking people to come to boulevard Anspach in the centre of Brussels every Sunday for a picnic in the road. 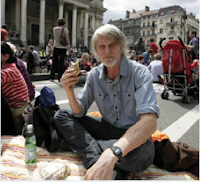 A Facebook event was created and more than 2,000 people held a picnic in the road on Sunday 10 June in front of the Belgian Stock Exchange (Bourse) asking the authorities to make more room for pedestrians and cyclists. Sustainable development, according to Van Parijs’ description, means that development will always continue. But humanity needs a sustainable way of living now and tomorrow, not something to be developed some day in the future. He also discussed reducing production and consumption as a way to lead to a more sustainable way of life. Today, the younger generation is facing many difficulties because of the economic crisis. Van Parijs says young people must be given hope in order to be more productive. They need to see that consuming less, even if it not a choice, can lead to a better and more sustainable life. I found Professor Van Parijs’ presentation so inspiring, an encouragement to continue living in a more sustainable way. It certainly seems like a good recipe!